AKA Samuel Augustus Nunn, Jr.
Elected to Congress in 1972 to fill the vacancy caused by Senate Richard B. Russell's death, and re-elected eleven times before declining to run in 1996. Conservative Democrat. 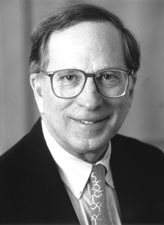 Chairman, Senate Armed Services Committee, 1987-95. Now in private life, Nunn is involved in nuclear nonproliferation issues. His granduncle, Carl Vinson (1883-1981), was a US Congressman from Georgia from 1914-65.